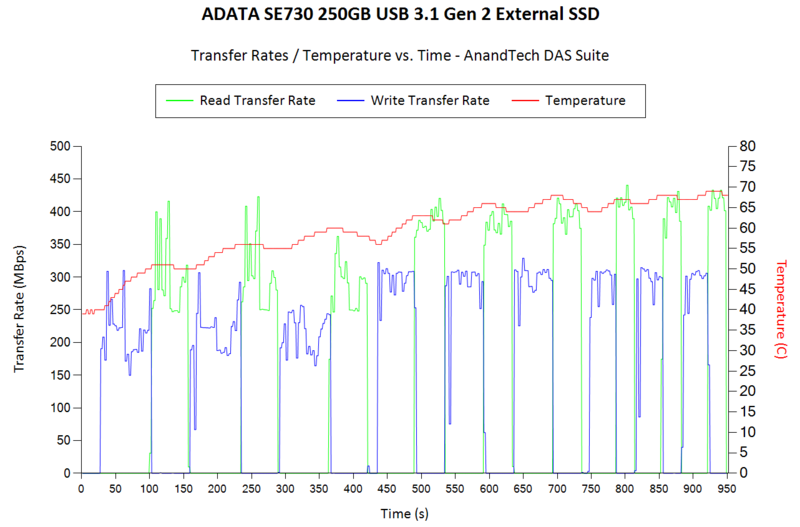 One of the most interesting aspects of external SSDs is the performance consistency for DAS workloads. Aspects that may influence this include thermal throttling and firmware caps on access rates to avoid overheating or other similar scenarios. Evaluating this is an important part of our benchmark process, as the last thing that users want to see when copying over, say, 100 GB of data to the external SSD, is the transfer rate going to USB 2.0 speeds. In order to identify whether the drive under test suffers from this problem, we instrumented our robocopy DAS benchmark suite to record the read and write transfer rates while the robocopy process took place in the background. For supported drives, we also recorded the internal temperature of the drive during the process. The graphs below show the speeds observed during our real-world DAS suite processing. The first three sets of writes and reads correspond to the photos suite. A small gap (for the transfer of the videos suite from the primary drive to the RAM drive) is followed by three sets for the next data set. Another small RAM-drive transfer gap is followed by three sets for the Blu-ray folder. 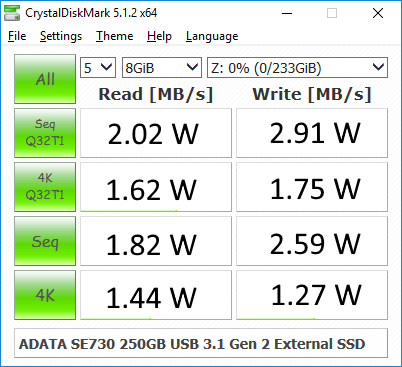 The SE730 has no performance consistency issues, though the temperature of the SSD goes as high as 70C. Our evaluation scheme is very taxing and goes beyond traditional usage scenarios (it is unlikely that any user would do 128GB writes and 128GB reads within a 20 minute interval on a 250GB external SSD). Despite the heavy load, the SE730 maintains its performance numbers. Unfortunately, the same can't be said for the SV620 and the SC660. The temperatures remain around 60 C for both, but the writes run out of steam after the SLC cache (around 6 - 8GB) is exhausted. 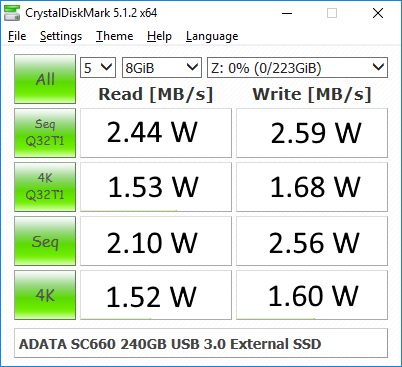 The sustained write speeds for the SC660 240GB version seems to be around 75 MBps, while the SV620 480GB version is worse off at around 55 MBps. The reads do not have any issues, though. The sustained write problem is unfortunately an issue wth all TLC drives that employ a fixed-size SLC cache. The power consumed by the SE730, SC660 and SV620 SSDs was measured under multiple scenarios using Plugable's USBC-TKEY power delivery sniffer. These scenarios were triggered using CrystalDiskMark 5.1.2 x64 with a 8GB test file and each test separated by a 30s interval.The average power consumption for each access trace was recorded. The pictures below present the numbers in a compact and easy to compare manner. 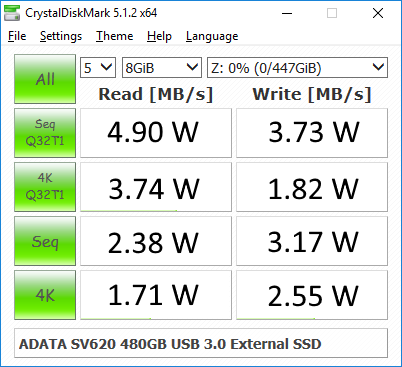 The numbers for the SC660 and SV620 are interesting in the sense that the drives continue to have spikes in the power consumption for a good 15 - 20s after the completion of the write access traces. This points to some SLC-TLC transfers taking place in the background. On the SE730 front, we are quite pleased to find that it is a very power-efficient platform.